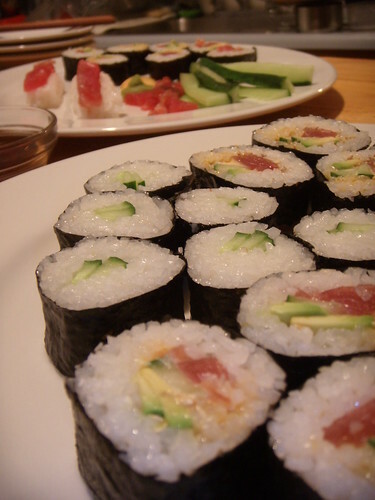 spicy tuna and cucumber sushi, originally uploaded by aarn! +17th July, 2008+. made some sushi rice the appropriate way (with a sushizu mixture), rolled some tuna, cucumber, sesame seeds, avocado, and some homemade spicy mayonnaise, in a seaweed wrapper. also made some with just cucumber and a few nigiri things with the extra tuna.